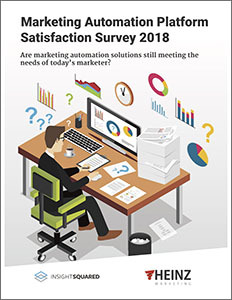 Are marketing automation solutions still meeting the needs of today's marketers? Heinz Marketing and InsightSquared parterned together to conduct this survey. We gathered the opinions of more than 400 marketing professionals currently using tops MAPs, including Marketo, HubSpot, Pardot, and more. Get your copy of the MAP Survey Report now!